This story appeared in the March edition of Hail Varsity. With James Palmer Jr.'s return to the Huskers, here's a look back at his breakout 2017 season and what lead to it. The story has been updated to reflect follower counts and timing. Glynn Watson Jr. has 5,627 followers on Twitter. The Husker guard has sent almost 15,000 tweets since he joined the social media platform in 2011. There’s retweeted birthday shoutouts, team highlights and, following the regular season, an attempt to figure out how the 22-10 (13-5 in the Big Ten) Huskers got left out of the NCAA Tournament. But Watson’s only second on the team in terms of number of followers; forward Isaiah Roby edges him out with 5,989. Maybe there are some bragging rights that come with that. Even head coach Tim Miles’ dog, Sammy, has an active account that’s right at 1,000 follows and it has only been around since February. Every Husker player is on Twitter. Well, all but one. James has never made an account and he doesn’t intend to make one in the near future. He’s not even on Instagram. No, he lets his game do that for him, and this season there’s been plenty of promoting. James Palmer Jr. is an All-Big Ten First Team guard, a twice-named All-District player and the leading man on the fourth-place team in the Big Ten. At a time when Miles was losing players left and right to transfer and the Husker basketball program was bleeding, Palmer arrived from Miami. A soon-to-be junior with a desire to just be himself, Palmer came to Lincoln an unknown commodity. In two years with the Hurricanes, the most Palmer had ever scored in a collegiate game was 17 points. He averaged 17 last season for the Huskers, topping that mark 15 times in 32 games. In those two years with Miami, Palmer never dished more than three assists in a game. He averaged three dimes this season, topping that mark 10 times. In two years with the Canes, Palmer never played more than 27 minutes. He topped that 23 times. The list goes on and on, career-highs in every single category statisticians track. 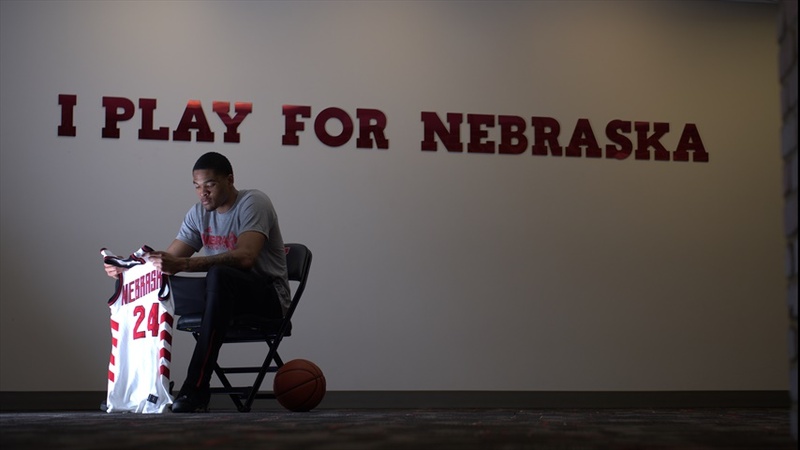 Palmer embodies last season’s iteration of Nebrasketball in more ways than one and he didn’t arrive overnight. The James Palmer Jr. the media gets to see is slightly different from the James Palmer Jr. that comes out when the setting is a little bit more comfortable. In postgame interviews, the dynamo 6-foot-6 guard is more reserved and precise with his words, almost even soft-spoken at times. But when he’s around those he truly trusts? “He doesn’t shut up,” Miles said, very plainly. 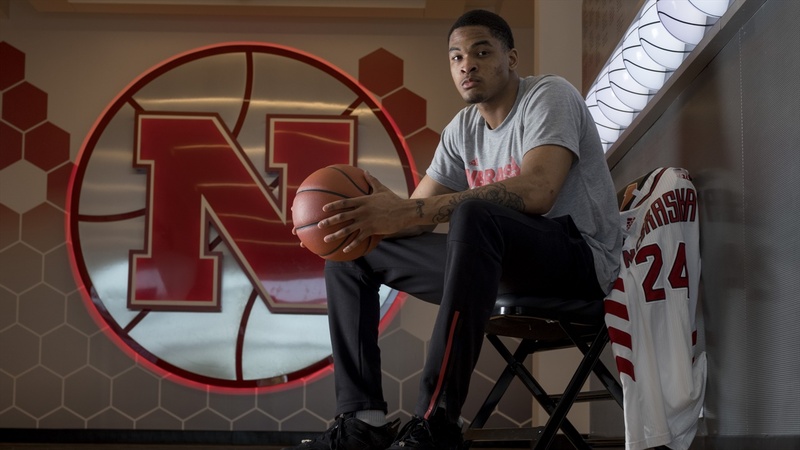 After the Huskers’ Big Ten Tournament exit, during that maddening week off between the end of their season and the decision on their postseason fate, Miles was coming out of a film session. Most of the time when he watches tape, he’ll get nervous and he can break out into a sweat. Palmer’s built a family with his new team; that played a role in his recruitment. The Husker fan base also helped influence his decision to trade the palm trees for the Haymarket, but Miles and former assistant Kenya Hunter sealed the deal. With the Hurricanes, Palmer felt out of place. The fit wasn’t right. He wanted to be able to play his game, be James Palmer Jr.
- Husker guard James Palmer Jr. Miles was just honest. That was important. He wanted to show Palmer that “what you see is what you get,” something that helped him see the potential with Nebraska. Palmer knew Miles wasn’t trying to bait and switch or feed him empty promises, he saw the track record. So they all get along just fine. Off the court, too. Palmer frequents the Nebraska women’s games on his off days along with guys like Watson and forward Isaac Copeland. “They come to support us so I just try to go support them,” he said. He has dinner with his teammates, they go out together and they stay in together. He carries his family back home with him, too, everywhere he goes. His grandmother’s name is tattooed on his right arm. The outside of his left wrist bears his mother’s name. On his left forearm, three roses — one for his brother, his sister and him — outline a “Family” script. He has two dates on the inside of each of his wrists: the day his father, James Palmer Sr., was born and the day he passed away. “I’m a big family guy,” Palmer says. Growing up in Upper Marlboro, Maryland, the goal was to get to the league. But Palmer didn’t even start playing with other kids until he was seven or eight years old. Before he would go play at the community rec center, Palmer would ball at home. He’s not into comparisons. He’s not like this guy or that guy; “I want to be myself,” he says. But that doesn’t mean Palmer didn’t try to pull things from other players. Tracy McGrady was a guy he watched when he was younger, Kobe was another. Bryant’s No. 24 is the inspiration for Palmer’s No. 24. Palmer says he “take(s) pride in scoring from all over the court,” in the same kinds of ways his NBA idols did, but his game is unique. Even in spite of the fact there’s still work to be done on his outside shot, since he was in high school Palmer’s game has been refined in a way you don’t typically see from young players. McAloon said he’s always admired the way Palmer plays under control. He never gets sped up or taken out of his game; he knows his spots and he knows where his bread is buttered. He shot 32 percent from three and still managed the team’s third-best true shooting percentage (55.9 percent); Palmer will take his shots but he won’t force things. He’s been a marked man and, still, he’s been a big-play producer. There are plenty of options to pick from when it comes to his best plays in a Husker uniform. The facial and subsequent technical-drawing mean mug against Penn State in the regular season finale feels like it should be top dog. When asked, McAloon took some time to think about what Palmer’s best high school play was. His Jan. 15 game-winning triple over Illinois wasn’t the first game-winner Palmer has hit. “The ball always found him late in games,” McAloon said. But the best play? Palmer’s Senior Night stood out. “He had a ridiculous tip dunk that came out of nowhere,” McAloon said. “It was a missed shot and he flew down the lane and went up and pretty much dunked it on three people. To someone that hasn’t paid much attention to Palmer’s career, that would probably be a good metaphor for last season. When it comes to NCAA transfers and the year players have to sit out, the prevailing thought is when a player comes back better than he was before, it’s because of the time off. He got to see the game in a different way. He developed a new appreciation for what had been taken from him, or something like that. In some cases that’s true. In Palmer’s case, that would be short-changing him. Palmer has put in the work. His season was a culmination of that. Ask his coaches to describe him and the first words out of their mouths are “gym rat.” When McAloon got a hold of Palmer in high school, he was “rail thin,” so he committed to the weight room and bulked up. In high school, you had somewhat limited access to a court or a weight room. At Nebraska, you just have to be out by 10 p.m., so Palmer hits the gym night or day, whatever fits his schedule. He’ll get a workout in with teammates or on his own. Basically, if you could build a player to resurrect a program, it would be Palmer. Go to any of the 351 Division I coaches and offer a guy who can explode for 108 points over a four-game stretch and then immediately scale it back and log as many assists as shots, they’ll take him in a heartbeat. Miles loves the work ethic, but the thing that separates it all is Palmer’s understanding of the game. Palmer’s always locked in. He spends time before each game trying to get his mind “mentally ready.” He’s not a guy that buys into superstition; the closest thing he has to a routine is a playlist for before the games — hype music from guys like Shy Glizzy, G Herbo and Lil Durk to more mainstream names like Drake and Migos — and a strategy he brings onto the court. 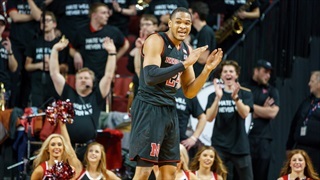 “I think we’re an NCAA Tournament team,” Palmer said of the Huskers. The selection committee didn’t feel the same. Palmer disagrees with the team’s dismissal from the NCAA Tournament field, along with pretty much everyone else associated with the program. When he was named by the league’s coaches to the All-Big Ten First Team, Palmer said the individual accolades don’t mean as much to him as team success does. When he was asked before Selection Sunday about whether a snub would be disappointing, he was raw. Nebraska was picked to finish second-to-last in the Big Ten this season. The Huskers remembered that. Palmer remembered that. He took it personal, put a chip on his shoulder. Gill said Palmer meant a lot to Nebraska this season. “He’s definitely had a huge impact on what we’ve done this year,” Gill said before the team left for its NIT game against Mississippi State. He figures to have an impact on what it does this offseason, too. The Huskers are angry. They don’t want to go through the uncertainty of another Selection Sunday. Palmer is no different. He wants to compete at the highest level and he wants to win. Until he gets another shot, you won’t find him on Twitter. Your best bet would be to check the Huskers’ gym.